The aim of the DRG project is to understand the relationship between water and magma in the roots of volcanoes and how heat is transferred into geothermal systems to maintain their energy. The latest technology will be applied in surveying, resistance measurements and seismic measurements, petrology, and geochemistry. In addition, new simulation models will be developed. These models will be used to simulate heat transfer and operation of geothermal boreholes for high-temperature steam. Furthermore, the design of wells and wellheads for high temperatures will be a focus of the project, as will methods for utilizing superheated steam from greater depths. individuals from universities, research institutes, energy companies and engineering companies, building a strong bond between academia and industry. The DRG Project would not have appeared if not a set of seminars and hard work of principal investigators in years before whom had a big influence on the final outcome. Seminars were archived as videos categorized below. hornfels, and a comparison with similar rocks observed, for example, in wells in Hellisheiði, and a project on evaluation of the infiltration of fluid into the intrusion through an isotopic study. Another subproject of DRG Part 1 uses seismic methods to study the roots of an active geothermal area, with the Krafla volcano and its geothermal system selected as a case study. The purpose is to study and map velocities of both S- and P-waves in and around the geothermal system in the Krafla volcano. Lastly, the third subproject of DRG Part 1 utilizes the Krísuvík geothermal area for a study of crustal deformation in geothermal areas. The project has mapped in detail repeated inflation and deflation periods in the Krísuvík geothermal area using both GPS geodesy and interferometric analysis of synthetic aperture radar images (InSAR). The aim of Modelling Part of the DRG project is to aid in the advancement of the methods that can be applied in the modelling of the physical processes occurring in the roots of volcanic geothermal systems, with the purpose of illuminating the overall process controlling the upwards heat transfer from the heat sources as well as improving and advancing the methods that are applied in conventional geothermal reservoir modelling and, consequently, used for geothermal resource management. The heat transfer from the roots up to shallower levels is a complicated process involving the flow of magma, the flow of fluids (two-phase and/or supercritical water), and heat transfer as well as thermo-elastic rock mechanics and chemical processes. In conventional models of the geothermal reservoir, used for assessing capacity and for management purposes during utilization, heat sources are idealized as a steady inflow of mass and energy, at relatively shallow depth, at the bottom of the models. There is, however, need to incorporate the heat sources more accurately in the models, both as specific intrusions in contact with the fluid circulation in the geothermal systems below the production reservoirs and their highly transient nature. 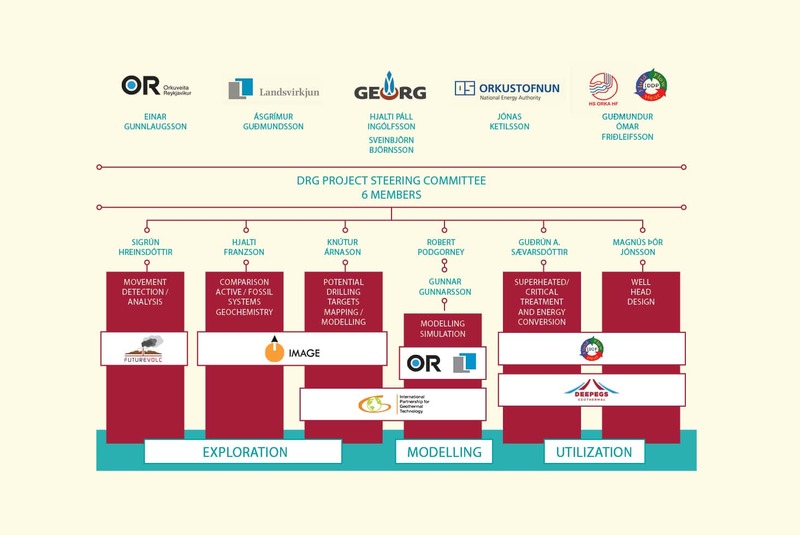 The Exploration Part of the DRG project is extensively based on general conceptual models emerging from Part 1 of the project. An essential part of utilizing geothermal fluid from the earth’s core is to transfer the fluid from the deep roots of the geothermal system towards the surface, utilize the energy to produce electricity, and reinject the fluid back into the earth. The main goal of this research is to develop a method to utilize the high enthalpy geothermal fluid which comes from drilling into deep geothermal systems. For efficient utilization design and reliable operations of the power plant and associated equipment, the extreme characteristics of the high enthalpy fluid have to be considered. For example, special considerations have to be made when selecting materials and designing the system which transports the fluid to the surface equipment. The challenges within this project are extensive but for a scope which can be managed within the frame of the DRG project, it has been divided into two parts. The objective of the first part is the design of a power process for energy utilization of high enthalpy geothermal steam with thermal, chemical and material considerations in mind. For that purpose, corrosion studies in simulated deep geothermal environment are also included in the first part. For the second part the main objectives are discussing the mechanics of materials for deep root equipment, corrosion, erosion, thermal and mechanical stresses, failure analysis and improvements in design.